On June 19, 2016, the Cleveland Cavaliers beat the Golden State Warriors to win the NBA championship. As is customary, the NBA Commissioner, Adam Silver, took to the stage during the postgame celebration to congratulate the team and to announce the winner of the most valuable player award. The award went to the star of the Cavaliers, LeBron James. But, when introducing him, Silver didn’t highlight LeBron’s play on the court or his impressive stats. Silver didn’t talk about LeBron, the basketball player; he talked about LeBron, the regional rhetor. “Two years ago,” Silver recalled, “[LeBron] wrote a letter to his fans in which he said, ‘I’m coming home.’” Silver’s remarks signaled that this moment was more than an opportunity for LeBron to celebrate a championship. It was an opportunity for LeBron to bask in the glory of fulfilling a promise he had made, in writing, to the city of Cleveland and to his home, the region of Northeast Ohio. Two years prior, on July 11, 2014, having opted out of his contract with the Miami Heat, LeBron announced that he was returning to the Cavaliers, the team with which he started his professional career in 2003, but also the team with which he had an acrimonious split in 2010. In the summer of 2010, LeBron’s decision to leave Cleveland wasn’t just any decision; it was The Decision, an hour-long special that aired on ESPN and drew ire for its exaggerated format. Notably, some fans burned their LeBron jerseys to demonstrate their displeasure.1 In the summer of 2014, LeBron didn’t do The Decision, Part Two. Instead, he made his intentions clear in a roughly 1,000-word essay posted on the Sports Illustrated (SI) website. The text, which I refer to hereafter as The Essay, outlines the rationale for LeBron’s return.2 Alongside a promise to do everything he can to bring a championship to Northeast Ohio, LeBron explains his desire to participate in the social and economic rehabilitation of the region. The Essay garnered 6.1 million unique visitors on the day it was posted, far outperforming anything else published previously by SI (Sloane). Although SI soon clarified that Lee Jenkins, a top writer for the magazine, helped to transform LeBron’s rationale into written text, this clarification did little to interrupt The Essay’s frenzied circulation.3 When the news broke, ESPN ignored everything else going on in the wide world of sports and discussed LeBron’s essay for two hours without interruption (Poggi). In addition to roiling the sports news landscape, The Essay was a social media phenomenon. A BuzzFeed article, “The Internet Explodes as LeBron James Announces Return to Cleveland,” captures an initial flurry of posts and tweets, many of which remix LeBron’s essay to produce enthusiastic, critical, or just plain funny responses (Carissimo). “My relationship with Northeast Ohio is bigger than basketball,” LeBron declares in The Essay’s opening paragraph. I argue that, likewise, The Essay is bigger than basketball. Given its explosive circulation, The Essay is an exceptional case study of writing and rhetoric circulating in contemporary media ecologies. As such, an ecological model aids in elucidating the factors that enabled The Essay’s circulation. In her seminal 1986 article, Marilyn Cooper suggests that, instead of the cognitive model that posits a discrete subject producing information for a stable audience, “the ideal image the ecological model projects is of an infinitely extended group of people who interact through writing, who are connected by the various systems that constitute the activity of writing” (372). Cooper’s “ideal image” is a prophetic depiction of The Essay’s circulation. An article in Adweek provides a statistical glimpse at the sprawl of networks: “50 percent [of the 6.1 million visitors to the SI website] came from mobile devices, and 32 percent were driven to the site from links on social media” (Sloane). These ubiquitous computing devices and social media platforms are features of what Sidney Dobrin, writing in 2011, describes as “the networked, hyper-circulatory, complex situation of writing in which we now find ourselves” (60). Dobrin is even more insistent than Cooper about the diminished status of the subject. To understand writing ecologically, he quips, “the subject must be removed not just from the center of the stage but from the theater and perhaps the entire theater district” (76). Yet, the provocative aspect of The Essay’s exceptional circulation is that the subject maintains a steady presence. In fact, circulation via social media served to propel LeBron towards the center of the stage. This is evident in a report from Yahoo Sports, which documents that, following The Essay’s publication, “Twitter’s trending topics quickly included #BackToCleveland, Coming Home and Good for Lebron [sic].” Quite simply, The Essay wouldn’t be The Essay without its famous rhetor. Importantly, though, as evidenced by the references to Cleveland and LeBron’s homecoming in that list of trending topics, there is another stubborn fixture: Northeast Ohio. Just as The Essay wouldn’t be The Essay without LeBron, The Essay wouldn’t be The Essay without Northeast Ohio. What comes to matter in circulation, and as a result of circulation, is that The Essay is always marked by its regional appeal. In what follows, I contend that The Essay’s exceptionality is best understood as a function of regional rhetoric in circulation. Regional rhetoric, which is both “a concept and a critical lens” (Rice 204), aids in scrutinizing discursive interactions that involve constructing and contesting regions. Analyzing the text of The Essay in conjunction with some responses to it, I demonstrate how The Essay revises perceptions of Northeast Ohio and how, as regional rhetoric in circulation, The Essay serves as an exigence for other rhetors to participate in the revision of this regional terrain. Ultimately, I argue that The Essay wouldn’t be The Essay without other subjects in addition to LeBron who are willing and able to contribute to the ecologies that make such regional revisions possible. Formulated by Jenny Rice, regional rhetoric is a variation on the rhetorical concept of topos, a metaphorical site where a rhetor houses appeals and arguments for easy access. Blurring the line between metaphor and materiality, “regional rhetorics are more specific and strategic instances of how topoi help to create space” (203). Rice’s formulation is indebted to the critical regionalism of Douglass Reichert Powell, who maintains that regions are fundamentally rhetorical. “Regions,” Powell explains, “are not so much places themselves as ways of describing relationships among places,” and he defines critical regionalism as the “deliberate use of region…to envision and critique relationships among people and places and envision better alternatives” (10). Claiming a similarly-potent progressive capacity, Rice insists that, in order to unsettle “kitschy or nostalgic” depictions of regions, “regional rhetoric disrupts given narratives of belonging…[and] provide[s] alternative ways of framing our relationships and modes of belonging” (203). Regional rhetoric is about persuading ourselves and others to revise the regional terrain we inhabit. Two such essays present opposing interpretations of The Essay’s mix of nostalgia and forward-looking hope. Writing for the now-defunct sports and culture site Grantland, Andrew Sharp downplays the basketball-related minutiae to arrive at this conclusion: “Now we get to watch [LeBron] go home and try to be a hero, and I don’t even care how clichéd and ridiculous that sounds, because that’s what’s happening.” LeBron’s essay, according to Sharp, is something that sports fans should “enjoy” and not “overthink.” Alternatively, Kareem Abdul-Jabbar, an NBA legend, articulates his discomfort with LeBron’s homecoming in an essay for Time magazine. Titled “Why LeBron Can’t Go Home Again,” Abdul-Jabbar argues that The Essay is overburdened with nostalgia. While he accepts its sincerity, Abdul-Jabbar criticizes its reliance on home as a “romanticized symbol” because, he asserts, when we invoke a sentimental longing for home, we too often deny the fact “that home, too, has changed because of our absence.” In effect, Abdul-Jabbar indicts The Essay for not being strategic enough. Sharp and Abdul-Jabbar are right to point out that The Essay does not avoid nostalgia. For instance, consider its titular refrain, “I’m coming home,” and the accompanying image of a contented LeBron that precedes the text on the SI website (Fig. 1). Consider also the opening lines: “Before anyone ever cared where I would play basketball, I was a kid from Northeast Ohio.” The Essay continues, “It’s where I walked. It’s where I ran. It’s where I cried. It’s where I bled. It holds a special place in my heart.” At the start, The Essay deflects attention away from LeBron’s celebrity status toward his upbringing in the decidedly less glamorous region he calls home. With this invocation of the past, The Essay risks succumbing to nostalgia by painting Northeast Ohio as an unchanging home to which LeBron can easily return. Figure 1. The image accompanying The Essay. But Sharp and Abdul-Jabbar neglect the specific and strategic nature of The Essay’s regional appeal. The Essay asks more of its readers than to bask unreflectively in the joy of LeBron’s homecoming. Conversely, it asks more of its readers than to indulge in the vaguely comforting connotations of home. In The Essay, home is linked to a dynamic portrait of Northeast Ohio. “Our community,” LeBron explains, “which has struggled so much, needs all the talent it can get.” LeBron acknowledges the well-worn narrative of the region’s economic plight in order to create the space for a new narrative. He explains, “My presence can make a difference in Miami, but I think it can mean more where I’m from. I want kids in Northeast Ohio, like the hundreds of Akron third-graders I sponsor through my foundation, to realize that there’s no better place to grow up.” The reference to Miami, the glitzy costal city he is leaving to return to Northeast Ohio, makes for an effective contrast. Northeast Ohio isn’t Miami. And that’s precisely the point. LeBron’s homecoming is bigger than basketball because he is returning, in Rice’s words, “[to] provide alternative ways of framing” Northeast Ohio. The Essay’s implicit acknowledgment that regions, and homes, are not static is an essential counterweight to the nostalgia that pervades its opening lines. What Sharp and Abdul-Jabbar overlook in The Essay is the decisive advance of a progressive hope aimed at revising perceptions of the regional terrain that LeBron calls home. 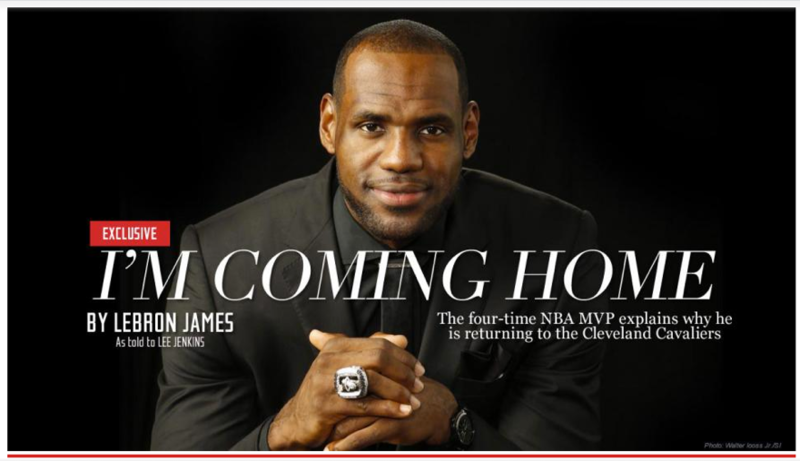 In a prescient column published in The Nation over a year before LeBron made his decision to return to Northeast Ohio, sports writer Dave Zirin suggested what LeBron’s homecoming could mean for the region. Highlighting the last few decades of deindustrialization, Zirin argued that if LeBron were “to marry the prime of his career to Cleveland, Ohio,” he could “become a state-wide avatar of regeneration amidst the vulture capitalism plaguing the Rust Belt.” Reading this rehabilitation narrative in The Essay requires interpreting its regional appeal as one motivated by forward-looking hope. The Essay ends with two declarative sentences: “I’m ready to accept the challenge. I’m coming home.” By the time readers arrive at the final word, “home” is not a reference to some indistinct place in the past, but a hope-filled appeal by one specific subject, LeBron, to the future of one specific region, Northeast Ohio. Is the region doomed to be forever associated with deindustrialization and economic plight? Or can these associations be revised to accommodate thriving economic opportunities, vibrant community life, and yes, NBA championships? The Essay’s circulation in contemporary media ecologies allows other rhetors to engage with these questions. By framing Northeast Ohio as something other than a helpless victim, The Essay functions as regional rhetoric to create “novel ways of appearing in publics and as publics” (Rice 211). The most compelling demonstration of this is a roughly four-minute-long video posted to the Cleveland Cavaliers website and NBA.com. It consists of residents of Northeast Ohio, black and white, young and old, reciting The Essay (“LeBron’s Homecoming Essay Read by Cavs Fans”). The video is a response to and, more strategically, an amplification of The Essay’s regional appeal. 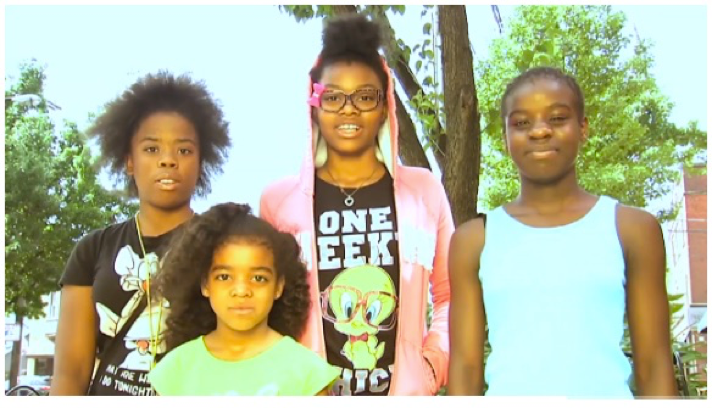 Four young girls recite the lines about kids growing up and thriving in the region (Fig. 2). Another resident, against a backdrop of smokestacks, recites the line about the region’s struggles. Joining The Essay in circulation, the video transforms the text into an audiovisual declaration of the rehabilitation of Northeast Ohio enacted by a rotating cast of regional rhetors. Figure 2. The Essay transformed by a rotating cast of regional rhetors. The Essay is exceptional for the ways in which it was and continues to be circulated. It is, for example, the basis for an assortment of lighthearted parodies and opportunistic advertisements.5 LeBron’s fame is, to be sure, a factor in circulation. But The Essay’s circulation cannot be explained entirely by the perceived singularity of LeBron writing for the web. By July 2014 when SI published The Essay, LeBron was already a prolific writer in digital environments, with active Twitter and Instagram accounts. He was also acquainted with the genre of the personal essay, having written about his experience of being raised by a single mother for The Shriver Report in January 2014. The Essay’s exceptionality exceeds its famous rhetor. So, Dobrin’s quip about the diminished status of the subject is relevant insofar as it encourages recognition of The Essay “not as the product (or process) of a producing subject but as a never-ending (re)circulation” (77). But The Essay does more than just circulate endlessly; it circulates as regional rhetoric enabled by other subjects in addition to LeBron who can engage with the ecologies that emerge interdependently with its “never-ending (re)circulation.” In other words, The Essay is made possible by other subjects occupying, if only fleetingly, the center of the stage. Tellingly, when Commissioner Silver referenced The Essay two years after its publication, he didn’t cite the portion that contained LeBron’s promise to win a championship. Instead, Silver quoted The Essay’s titular refrain: “I’m coming home.” That the refrain continues to circulate in the present-progressive tense is a fitting suggestion that LeBron’s homecoming and, by extension, the rehabilitation of Northeast Ohio are works-in-progress. Powell argues that appeals to regions do not express “essential qualities,” but, rather, contribute to “ongoing debates and discourses that coalesce around particular geographical spaces” (14). Regions, as rhetorical constructs, are not static. They emerge with(in) circulation. This introduces contingency into the regional terrain we inhabit, which, advantageously, invites all of us to attend to the ecologies in which regions are constructed and contested. Abdul-Jabbar, Kareem “Why LeBron Can’t Go Home Again.” Time, 12 July 2014, http://time.com/2977353/lebron-james-cleveland-cavaliers/. Accessed 17 Jan. 2015. Braiker, Brian. “Brands Awkwardly Crash LeBron’s Homecoming.” Digiday, 11 July 2014, http://digiday.com/brands/lebron-james-decisions-brand-reaction/. Accessed 24 Feb. 2016. Carissimo, Justin. “The Internet Explodes as LeBron James Announces Return to Cleveland.” BuzzFeed, 11 July 2014, http://www.buzzfeed.com/justincarissimo/back-to-cleveland#.fbOd03oyz. Accessed 17 Jan. 2015.
Cooper, Marilyn M. “The Ecology of Writing.” College English, vol. 48, no. 4, 1986, pp. 364-375. Accessed 20 Jan. 2012. Dobrin, Sidney I. Postcomposition. Southern Illinois University Press, 2011. Gries, Laurie E. Still Life with Rhetoric: A New Materialist Approach for Visual Rhetorics. Utah State University Press, 2015. James, LeBron. “I’m Coming Home.” Sports Illustrated, 11 July 2014, http://www.si.com/nba/2014/07/11/lebron-james-cleveland-cavaliers. Accessed 17 Jan. 2015. Poggi, Jeanine. “ESPN Went Two Hours Without an Ad Break After LeBron James Jilted Miami.” Advertising Age, 11 July 2014. http://adage.com/article/media/espn-commercial-free-lebron-james-news/294099/. Accessed 26 Feb. 2016. “LeBron Exits Miami for Cleveland Homecoming.” Yahoo Sports, 11 July 2014, http://sports.yahoo.com/news/lebron-james-exits-miami-cleveland-homecoming-183416467–nba.html. Accessed 24 Feb. 2016. “LeBron’s Homecoming Essay Read by Cavs Fans.” NBA.com, 4 September 2014, http://www.nba.com/video/channels/nba_tv/2014/09/04/20140904-lebron-essay-fans.nba. Accessed 17 Jan. 2015. “LeBron James – I’m Coming Home.” Genius.com, 11 July 2014, https://genius.com/Lebron-james-im-coming-home-annotated. Accessed 25 Jan. 2015. Lee, Michael. “Dan Gilbert Letter: Cavaliers Owner Unloads on LeBron James.” The Washington Post, 9 July 2010, http://voices.washingtonpost.com/wizardsinsider/2010/07/cavaliers-owner-dan-gilbert-un.html. Accessed 17 Jan. 2015. Rice, Jenny. “From Architectonic to Tectonics: Introducing Regional Rhetoric.” Rhetoric Society Quarterly vol. 42, no. 3, 2012, pp. 201-213. Web. Accessed 5 Dec. 2012. Powell, Douglas Reichert. Critical Regionalism: Connecting Politics and Culture in the American Landscape. University of North Carolina Press, 2007. Sandomir, Richard. “Getting the Scoop, but Not Necessarily the Story.” New York Times, 11 July 2014, http://www.nytimes.com/2014/07/12/sports/basketball/role-of-sports-illustrated-in-lebron-jamess-announcement-raises-journalistic-questions.html?_r=0. Accessed 17 Jan. 2015. Sharp, Andrew. “A Perfect Storm and a Perfect Ending: LeBron’s Going Back to Cleveland.” Grantland. ESPN, 11 July 2014, http://grantland.com/the-triangle/lebron-james-return-cleveland-miami-heat/. Accessed 17 Jan. 2015. Slevin, Peter. “Cleveland Reacts Unhappily to James’s Departure.” The Washington Post, 10 July 2010, http://www.washingtonpost.com/wp-dyn/content/article/2010/07/09/AR2010070905248.html. Accessed 13 July 2016. Sloane, Garett. “LeBron James Gives Sports Illustrated Its Best Day Ever Online.” Adweek, 14 July 2014, http://www.adweek.com/news/technology/lebron-james-give-sports-illustrated-its-best-day-ever-online-158905. Accessed 17 Jan. 2015. Zirin, Dave. “The Aspiring Folk Hero: Why LeBron James Will Return to the Cleveland Cavaliers.” The Nation, 25 March 2013, http://www.thenation.com/article/aspiring-folk-hero-why-lebron-james-will-return-cleveland-cavaliers/. Accessed 17 Jan. 2015. 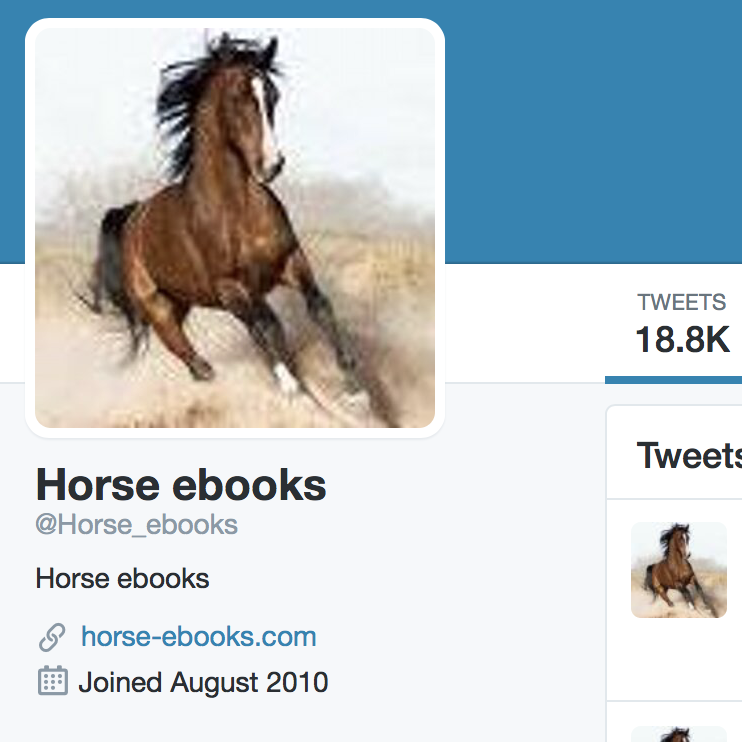 The Moral Act of Attributing Agency to Nonhumans: What Can Horse ebooks tell us about Rhetorical Agency? Jens Lloyd is a PhD candidate in the English department at UC Irvine. He currently serves as an editorial assistant for College Composition and Communication and Rhetoric Society Quarterly. 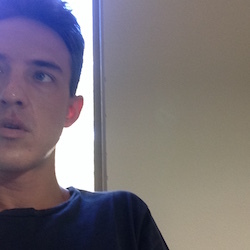 He focuses his research and teaching on the geographies and ecologies of rhetoric, writing, and literacy. While he is a fan of LeBron, Jens expends most of his energy cheering for the Los Angeles Lakers.